Get her off me sarge?!?! 6 What is to come! Hello everyone, and welcome to Issue 5 of of the newly renamed Halo News Network. Now I have to say Happy late Yanumas, where in some galatic timezones it is always Yanumas(also Happy late 16th birthday Halo). Now to get started this issue goes over how we got our new name, a breakdown of the recent lootcrate, the start of a new section relating to the lootcrate called the Apollo Investigation Bureau, and a few community spotlights. Welcome to The Data Pad, our brand new way to give you news about the news network itself, and Halopedia. One of our old retired admins Spartacus is requesting to rejoin us so if you want to vote in his request for admin. Please take a minute to give your input here. Now as the intro suggested how did we choose our new name the Halo News Network, we did a vote on twitter here, and Halo News Network and The Data Pad ended in a tie. So to avoid us losing both names that you all wanted, we decided to keep both. Making the Halo News Network the main name, and The Data Pad our internal news name. We hope you like how we did things. This is the main meat of the article today, the recent lootcrate QUARANTINE ZONE. Why is this crate so awesome? Was it worth it? Lets get to it shall we. *Note: There is also a data drop in this crate but we go into detail of that in the Apollo Investigation Bureau. Continuing on the art of this crate is the poster. The poster is Pavium from Halo Wars 2: Awakening the Nightmare fighting the flood. And it shows the "Brute force" of Pavium as he is not being broken by the flood, but standing his ground. The art being by Isaac Hannaford a Halo art veteran, for which if you like his art you can see more here. But now lets get onto the actual loot shall we. The big item of every crate is the Halo Icon. This icon is of an infected Marine with an Pod Infector infection form. The poster of the Crate calls this Marine Kevin from 2nd Platoon, and what a fate Kevin got. The pros of this Halo Icon is that Kevin is one of the most durable Halo Icons around, not having little bits and bobs that could break off or you have to attach, and the lil infection form Pod Infector is one of the most well made infection forms made to date. The cons though is that the Pod Infector infection forms legs are very fragile and feel like they might break if you held it wrong, and there is no way to attach the Pod infector to the base, and the face of Kevin may put you off the Halo Icon itself. But bar the head the body of the icon is great with details that make sense of a mutated Flood combat form. 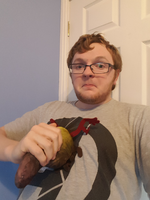 Another cool thing in this crate is the pod infector plush, this pod infector is really cool as it has velcro hook that can be used to make it attach onto clothing as shown in the header image at the start of this article. Though if there was any problems with it. It would be the tendrils on it, as they feel like they may break off if any force is applied to it, but that issue is minor as they do they job they were intended for. Now the Needler Pens, oh how they are cool to look at. They come in a stylized box with Covenant symbols on them(which we cant read at the moment). And one has black ink and the other purple ink. But while cool to look at the pens may not be the most comfy thing to hold when using them normally. But if you are setting up a Halo collection, the pens in the box look really good regardless if you plan to use them or not. The shirt is a cutesy navy blue Spartan Exterminators shirt. Where it has a Spartan holding a gravity hammer facing off a lone Pod infector. And the pin is one suitable for the crate its in, a M45 shotgun, a weapon often seen as the best way to kill off Combat forms in the games. Our thoughts of this crate is mixed, it has a lot going for it, like the great Needler Shard pens, and the Pod Infector plush, but is put down by the head of the Halo Icon being too off putting, and the tendrils of the pod infector feeling to fragile. But overall due to the presence and quality of the items, the crate was worth it, though if you would want to look at Kevin, well that is up to you folks. The crate when it was opened for the first time. The Halo Icon in the box. The back of the Halo Icon box. The Box of the needler shard pens. Hello Spartans and welcome to the Apollo Investigation Bureau. A place where we pool our own investigation efforts into several topics given to us in Halo Lootcrate Data Drops. Due to the very nature of our investigations, the assignments may not be easy, some may even change during the course of the investigation, but we believe like any good archer, that if we aim hard enough we may hit our mark sooner or later. But only time will tell if he have the mettle too. So lets get to it Apollo. Because this is our first release this section will be a lil bigger than normal as we deal with 2 data drops, but first we will currently go over our current assignment which is investigating the recent Guardian Incident in October 2558 and the events surrounding it, hopefully to find a root cause of why Cortana turned against Humanity. Was she merely rampant or is there some external matter at hand? The first data drop in this is "The Cyroraeth's Dialogue". This is is all about Cortanas interactions with Aine the UNSC Infinitys first AI, and shows us information from when Cortana had a rampant spike on Infinity itself. Now to catch up to the most recent data drop given in this months Lootcrate we are given. We are given information on "Subject Denver", a San'Shyuum who survived the fall of High Charity in 2552, and how he heard a female Human AI who might have been infected by the Logic Plague. The Cyroraeth's Dialogue seems to suggest that Aine was killed by Cortana somehow, and that her Rampancy was a part of it. How this connects to the Guardian event is unknown but it could be that Cortana is not fully healed from the effects of Rampancy as she once thought? Subject Denver seems to suggest that Cortana might have received the logic plague from the Flood. Something that could made AI or Ancilla corrupted by the Flood and make them work for them or drive them to madness. While there is a chance Cortana got away from the Flood without the seeds of the logic plague, there is a chance she was infected. With that two in mind its possible that either rampancy, or the logic plague, or possibly even a little of both helped cause the Guardian Incident. But right now the hunt remains for more information. shesagdb on reddit made some yummy looking Master Chief cookies for her boyfriends birthday that makes us real jealous as they look so yummy. You can see one of the cookies here. Our good friends at Podcast Evolved released a new podcast episode. Episode 136 - All the K's and all the X's. Give it a listen if you are looking for a new podcast. HiddenXperia released a new video on the Flood and how they are the beginning, middle, and end of the Halo Universe. You can view it to the right or click here. And if you are after a video form of an unboxing of the recent lootcrate, Halo Canon has you covered. Click here to view it.